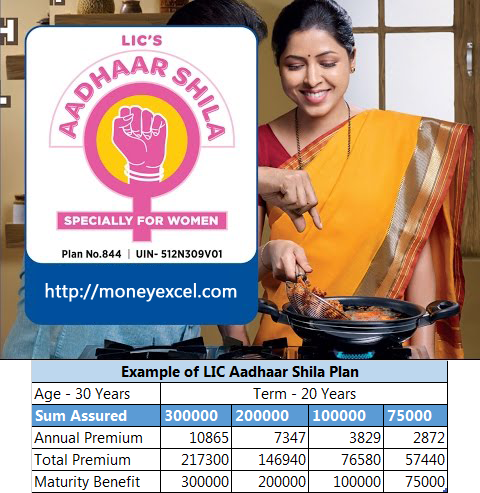 LIC Aadhaar Shila Plan (Table 844) is new Aadhaar based life insurance plan. This plan is launched along with Aadhaar Stambh Plan (Table 843). 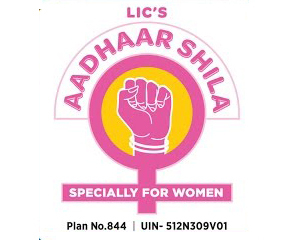 This plan is exclusively designed by LIC, for the female candidate having Aadhaar Card. The main reason of keeping policy name Aadhaar Shila is to take benefit of growing popularity of Aadhaar Card. Both the plan Aadhaar Shila and Aadhaar Stambh Plan is same except premium amount and gender eligibility. LIC Aadhaar Shila policy is non-linked with profit regular endowment plan. It is a first plan launched by LIC in the year 2017. This plan is available from 24th April 2017. The key features, benefits and other detail about this plan is given below. Also Read – How to Link Aadhaar with LIC Policies Online? Aadhaar Shila policy can be taken without undergoing any medical checkup. Holding Aadhaar Card is mandatory for this policy. It is low premium policy and maximum cover available under this policy is 3 Lakh. This plan provides the auto cover facility. All premium paid under this policy is exempted from Income tax under section 80C. A maturity amount under this policy is tax-free under 10D. Death Benefit – In the case of unfortunate death of policy holder during first five years of the policy, basic sum assured shall be payable as a death claim. On death after five years of the policy, basic sum assured and loyalty addition shall be payable as a death claim. Auto Cover Benefit – Auto cover benefit provide insurance coverage in case you forgot to pay a premium of the policy. If you have paid 3 years premium, you will get 1-year auto cover benefit from first unpaid premium. If you have paid 5 years premium, you will get 2 years auto cover benefit from first unpaid premium. Optional Accidental Benefit Rider – You can avail additional accidental benefit rider under this policy. You need to pay an extra premium for the same. In the case of accidental death, accidental rider benefit along with basic sum assured shall be payable. Let’s take an example of Aadhaar Shila Plan with following details. Mr.Ragini age 30 years decide to purchase LIC Aadhaar Shila Plan (Table 844) with a policy term of 20 years. She needs to pay Rs. 10865 yearly premium for this policy. Total premium paying term will 20 years. In 20 years he will pay a total premium of Rs.2,17,300. If she survives till maturity. The total maturity benefit payable will be Rs.3,00,000 + Loyalty addition. Total risk cover in above case will Rs.3,00,000. In a case of unfortunate death of policy holder during premium paying term. The same benefit Rs.3,00,000 + Loyalty addition shall be payable. If you are planning to purchase LIC Aadhaar Shila for insurance cover you should think twice. The maximum sum assured under this policy is Rs. 3 Lakh. This sum assured is not enough. The value of 3 Lakh after 20 years (policy term) will be very less. The Premium paid for this policy is very high compared to typical term plan. In this value, you can get an insurance cover of Rs.50 Lakh or above. If you are looking for risk cover Pradhan Mantri Jeevan Jyoti Bima Yojana offers risk cover of Rs.2 Lakh at an annual premium of Rs.330, which is much cheaper than this policy. LIC Aadhaar Shila is like typical endowment plan that will end up giving you return in the range of 5-6%. This plan offers loyalty addition after 5 years. However, No bonus is payable on this plan. So it is a big no for this plan from an investment point of view. The only benefit offered by this plan is auto cover option and no need for a medical checkup. I hope I have done my job with a sense of your satisfaction, now it is up to you to either invest in LIC Aadhaar Shila Plan or not.